Styrmir Kári & Heiðdís are wedding photographers from Iceland. We had their attention for a few minutes to share a bit more about themselves and what it is like to be local to one of the most hyped wedding locations in the world the past few years. WUN: So, for those who don’t know you, who are Heiðdís and Styrmir Kári? Styrmir: We are a couple, born and raised in Iceland. We have lived our whole lives here, doing photography before we started shooting weddings. I was working for a newspaper and Heiðdís was working for the magazines here in Iceland and then somehow we transitioned into weddings. That’s almost our fulltime job now. There are a few other projects on the side, but mostly weddings and related shoots. WUN: So how long ago did you start shooting weddings? Heiðdís: Almost four years now. WUN: So the whole Iceland wedding photography thing was already a big deal I guess? Styrmir: Yeah, it had already started. WUN: So have you noticed that the wedding industry in Iceland has changed over the years? Styrmir: Well, it’s kind of two separate things going on. You have the local Icelandic market, that hasn’t changed that much, and then there’s this whole other market of people from other countries coming in getting married and travelling, and that has blown up like crazy for the past years. So while the local market is not that different, there are now vendors that specialise in the foreigners coming in and just servicing them. WUN: Like Icelandic vendors or? Heiðdís: Yes, exactly. They focus completely on foreign weddings and do not do local weddings usually. I think about 90 percent of what we do is destination elopements and not so many local weddings. WUN: So do you notice the local people picking up on the international thing more and more or is it still mostly traditional? Styrmir: It is still very traditional out there. Heiðdís: People here ask “why are these people coming here and getting these amazing wedding photos and then we just have our photos in the park?” But we don’t see that many people doing something about it though. WUN: I guess that’s something that a lot of photographers ask themselves about Iceland – what is it like for you who are local to see all these international wedding photographers and couples coming in to Iceland and shoot weddings where you live? I’m guessing you do get quite a few of these international weddings or is the competition crazy because there are so many people flying in? Heiðdís: We’re not unhappy about it, because these photographers are making it more popular for couples to come and get married here. WUN: Yeah, so if they hadn’t come, you would not have as much work as you do maybe. So it’s actually good for you. Heiðdís: Yeah, I think so. Styrmir: I think the only problem we have is people that do it for free. Like people who pay their own flights just to come here and shoot. Because you can’t really compete with that. WUN: Yes, every photographer wants to shoot a wedding in Iceland. So they will do the first one for free anyway. Styrmir: Yeah. But like Heiðdís said, it’s good publicity. It makes people want to come here. So I bet there are of course pros and cons with everything. But we don’t complain about it. We have plenty of work. WUN: That’s great to hear. Styrmir: I guess the market is big enough for a lot of photographers, for the moment, at least. WUN: So how do you differentiate yourself from the other photographers coming here? Maybe you know the more interesting local places to shoot or? Styrmir: Yeah, I guess there are always benefits of hiring a local photographer. I mean, we’ve lived here our entire lives. So we have information about locations and we know the weather and how fast it changes. Heiðdís: We know the weather so we can tell if it’s a bad day in a certain location and can change and go somewhere else. Styrmir: The weather is very unpredictable. So you learn pretty quickly how to adapt to different situations and stuff like that, but other than that, we just try to be ourselves in our marketing and when we talk to people. So we’re not trying to differentiate ourselves in any particular way I guess. Heiðdís: One thing we try to do more is getting people to go to places that aren’t really known. Because a lot of people think that Iceland is so touristy now. Perhaps not as fun anymore or that you can’t be alone anymore because there are people everywhere. But we know plenty of places where no one goes – a lot of people will just want to go to the South Coast and see the same places they’ve seen on the internet. So we try to take them on unknown roads, up the mountains to less populated places where you can be on your own. WUN: That’s a good thing about hiring you. You would know these places, when many other photographers might not know about them. 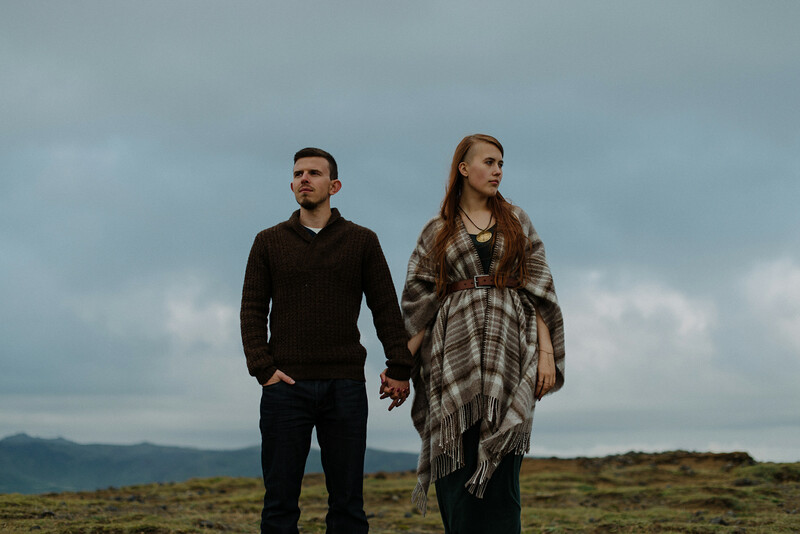 Styrmir: I think most people that are eloping or having their destination wedding in Iceland are looking for this more private, secluded thing than in a big city, surrounded by people. They would come because they have seen some crazy beautiful images on Instagram or something and they’re all the same places. And on the South Coast of Iceland where the big waterfalls are they are so popular and don’t really offer that private feeling anymore. WUN: Someone told me recently that the problem with shooting in Iceland is to edit out all the tourists who hang around these places. Styrmir: Yeah. But the thing is, there are these few places that are like that. We know other locations that are just as beautiful. You just have to look for it or know where to go. WUN: That’s your unique selling point I guess. Heiðdís: We try to make it as much as an experience, not just trying to make beautiful pictures for people. But we want to show them Iceland. Travel with them and kind of look at it like we’re just traveling with friends. We get the experience too and get to see the country through their eyes. Styrmir: Yes, we try to tell people about cultural things in Iceland. To make it about more than just the photos. We are both in this business because we find people very interesting and get to know people from all over the world. Something which I guess we didn’t really expect when we started shooting weddings. We’ve shot Indian weddings and weddings from all over the world here, that’s what keeps this interesting I guess, getting to know all these people and connecting with them and seeing Iceland through their eyes. So, thank you Styrmir Kári & Heiðdís for taking the time to talk to us!